Experience Years of translation experience: 19. Registered at ProZ.com: Oct 2000. Became a member: Jun 2008. 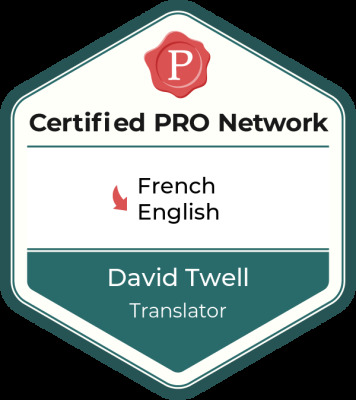 Professional practices David Twell endorses ProZ.com's Professional Guidelines (v1.1). Having successfully completed an MA in Translation (University of Surrey) in 2000, I worked first as an in-house senior translator for a French translation company in the UK before establishing myself as freelance professional. 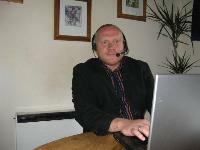 I currently work for several trusted agencies throughout Europe and the USA as well as for a few select direct clients. Thanks to over 12 years experience in the translation world, a career in which I have used languages on a daily basis and a thorough academic grounding in languages and translation theory and practice, I consider myself to be ideally positioned to offer high-quality translations to my clients. - German to English translation: non-specialist and/or shorter texts preferred, but I have extensive experience of medical, legal and business texts in this language pair. Please thank your en-GB editor, David, and let him know that he did a great job for us. We’ll miss seeing his open issues as he always had good ideas and pointed out English source errors." "Je tenais à vous faire part du retour de notre client concernant ce projet. "We were again pleased with the quality of your work and your responsiveness." "Thanks for your translation, it is absolutely perfect and I really enjoyed reading it!" "Hi David, Please find attached the latest TMX... Thank you for your excellent work." Interested in working with me? Please visit my website.